Strange Conspiracies: Could a Zombie Outbreak Be Closer than We Think? Could a Zombie Outbreak Be Closer than We Think? I know what you're thinking zombies....yeah right. 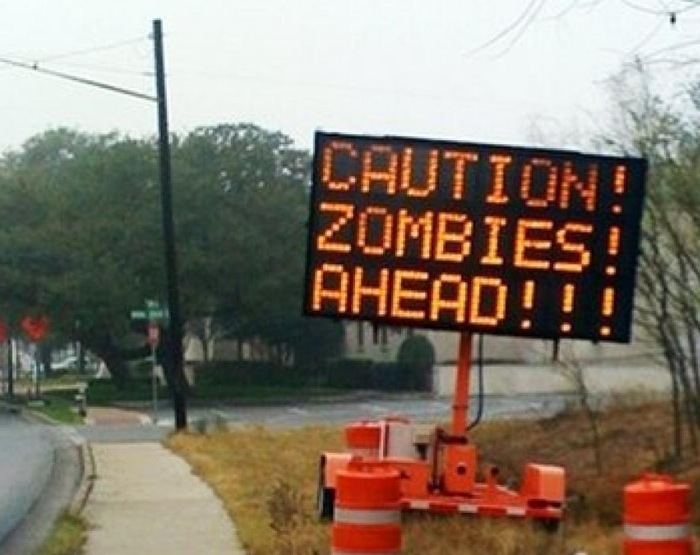 The truth is though the CDC has released a zombie preparedness guide in 2011. I have already done an article about that on this blog. If you want to read that article you can check it out here...As I read more and more of the news however it seems that this is looking more and more like a possible outcome and a hint of the end of all civilization on Earth. If there really is such an outbreak I fear that we may have little to defend ourselves. A virus that spreads in such a way would affect millions of people in a matter of days. Big cities would be the first to go, but eventually there would be no where to hide. Sure you can prepare yourself but that is only delaying the inevitable. Let me share with you some of the news stories that have been going on in recent weeks that may be hinting towards a new contagion that could actually cause zombies, and even reanimate the dead. Very scary stuff. First news article I want to mention is an outbreak that has happened in Florida. This is not the only school to have students and teachers break out in a rash all of a sudden. Not all of the students were affected and the HazMat team quickly arrived and had the students shower twice, and transported to a nearby hospital. In non of these contamination stories (mostly at schools) no cause has been found. This I think is the scariest part of this situation. No one really knows what this is. I will provide all links to articles I have found that I have mentioned in this article at the bottom. This is really weird stuff. This is also not the only HazMat team that has been called out in Florida in the past week. Two of these outbreaks occurred in Broward County schools. They were also dispatched to the International Airport in Florida to investigate why 5 people were sent to the hospital after some sort of aerosol can busted in someones luggage. Could this have been the cause for the outbreak? Whatever it is, they aren't exactly giving us answers. Just raising more questions. Ok so I know what you're thinking...rashes outbreaks, still no mention of anything zombie like right? Ok you asked for it...In this next news article you will get your satisfaction (if I would even call it that). A 31 year old naked man by the name of Rudy Eugene was reportedly eating the face off of a homeless man. When the police arrived on the scene they fired gunshots around him to get him to stop, but Rudy did not budge he still continued eating the flesh off of this poor homeless man's face. He was finally shot down and killed. I see no reasonable explanation for this, and no rhyme or reason has been released to the public. This all happened in Miami. Getting scared yet? Don't worry I will include the link to the article at the bottom. I am still not finished. If all of these articles were not scary enough, the University of Illinois has tweeted the following message on their official twitter page.... "Hazardous materials released at Institute for Genomic Biology. Escape area if safe to do so. Otherwise seek shelter." Their official twitter username is @IlliniAlert. I will post the link to the tweet at the bottom of this article. Obviously whatever has been released has the ability to spread very quickly. Trust me folks this kind of stuff they don't want to report on main stream news and cause panic. Something is going on. In Hackensack New Jersey a man resisting arrest, stabbed himself repeatedly in the stomach and began throwing his own intestines and flesh at police officers. This is totally out of control. Whatever it is seems to be spreading and the news reports seem to be getting worse and worse. The officers sprayed 2 cans of pepper spray at the man, and it had no effect. I don't know what would cause this but maybe the University of Illinois might have something to do with it. You would think pulling out your own intestines would be painful enough, but to also have the strength to throw them at officers? Very strange. I don't know what is going on. Whatever it is its spreading, and its getting more and more out of control. Sure some of these things could be isolated incidents however, one thing they all have in common is that the police are not reporting it in main stream media, and they aren't offering any type of explanation. If you live in the area, I suggest consider relocating for the time being. Who knows how many other places could become infected, obviously because of the incident at the International Airport in Florida, this could be the delivery system. We are all in for something big. I hope it is not too late. Please leave a comment and let me know what you think about all this. Here are the links to all of the articles mentioned in my article. Mind you all the links I am providing are not links to other conspiracy sites. These are all credible news outlets. Just keep that in mind. 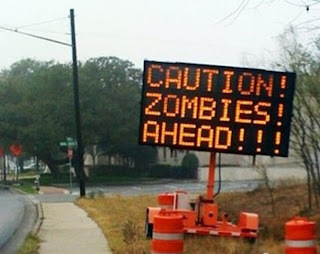 I have been doing more research on this zombie phenomena that has been sweeping over the United States. After many people like me have been reporting on the situation and providing reference links to show that we are not crazy, big news outlets with high Google page rank are posting on these stories such as The Washington Post, Reuters, and Associated Press just to name a few. I believe the reason they are doing this is to drown out posts like mine that have an open mind. I am not pointing the finger any which way, anything could be to blame...however, I noticed that the common denominator in all of these news stories that have been coming out is that the cause of these zombie like 'incidents' has to do with bath salts. Bath salts (not the conventional kind) are a synthetic drug that a lab has created. They use the cover as bath salt so that they can sell it with the label 'Not For Human Consumption'. The high is similar to methamphetamine and increases your heart rate, instantly makes you addicted, and gives you the strength of 10 men. Of course, those are the short term affects. No one really knows what the long term affects of this drug really are. In the short term though its affects are greatly similar to crystal meth. This drug can be smoked, injected, or snorted just like crystal meth. When people become addicted and start using larger and larger quantities to get high sure they could act zombie like. Is this really the cause of the problem though? It's hard to say. One thing is for sure the authorities have had a problem with bath salts. A convenient way to get rid of the problem is to say that you could turn into a 'zombie'. That campaign sure beats any sort of "This is your brain on drugs" commercial. I guess this is why I doubt this cover story. I know people that have done massive amounts of drugs, sure they became somewhat zombie like....however no one has tried to eat my face off or throw their own intestines at me. That is just too weird. I wouldn't be so quick to blame everything on bath salts. That doesn't mean that bath salts or any other name they might give the synthetic drug is a good idea. I would still try to avoid it. 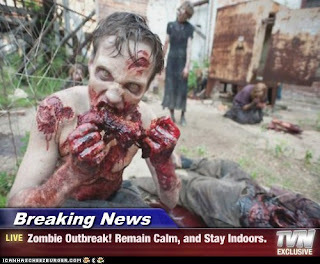 I just figured I would add this to the post, since I find it strange all of these news outlets are now reporting on a "Zombie Apocalypse: Bath Salts to blame". I am not that narrow minded. Keep your minds open my friends. Always search for the truth using your own means. Take everything that main stream media reports on with a grain of salt. This is how the truth is drowned out using excuses that back up their "war on drugs" for example. TWEET: Hazardous materials released at Institute for Genomic Biology. Escape area if safe to do so. Otherwise seek shelter.